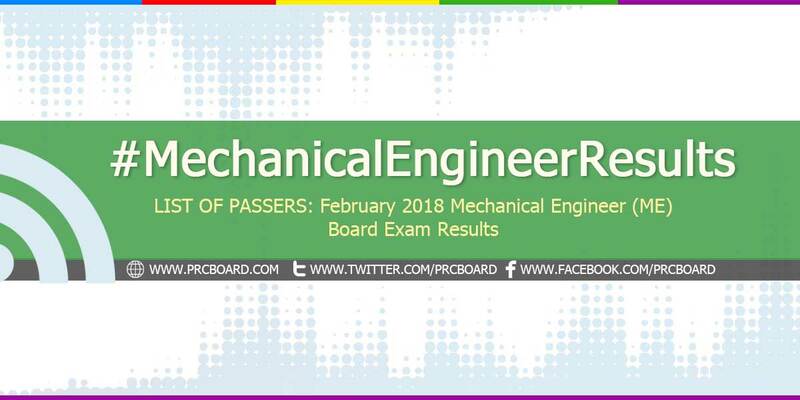 The results and list of passers of the February 2018 Mechanical Engineer (ME) board exams including the top 10 examinees, top performing schools and related announcements are available at this website as the Professional Regulation Commission (PRC) officially releases the results online three (3) working days after the last day of board examinations. As announced, 933 out of 1,983 passed the Mechanical Engineer Licensure Examination and 20 out of 44 passed the Certified Plant Mechanic Licensure Examination. The February 2018 Mechanical Engineer and Certified Plant Mechanic licensure exams are administered by PRC Board of Mechanical Engineering headed by its Chairman, Engr. Jesus M. Redelosa and its members, Engr. Fernando S. Guevara and Engr. Mirardo C. Malazarte, Jr. on February 26 & 27, 2018 at PRC testing centers in Manila, Baguio and Cebu. The schedule of online appointment for issuance of Professional ID and Certificate of Registration will be from March 7-16, 2018. As per Resolution No. 2017-1068 entitled "Schedule of Licensure Examination for Year 2018", the target release of February 2018 Mechanical Engineer and Certified Plant Mechanic board exams result will be on March 2, 2018 (Friday) or three (3) working days after the last day of exams. However, the above-mentioned date is not final as PRC may also release the ME & CPM official results earlier or later than the stipulated date without prior notice. Just keep tuning-in at at this article for timely updates. On the same exams conducted PRC on September 2017, results were out in two (2) working days. On March 2017 and March 2016, results were released after three (3) working days while during September 2016, results were published after six (6) working days. The two-days Mechanical Engineering board exam covered topics from Industrial and Power Plant Engineering (35%); Mathematics, Engineering Economics and Basic Engineering Services (35%); and Machine Design, Materials and Shop Practice (30%). Thus, Certified Plant Mechanic board exam covered topics from Elements of Power Plant Machinery (30%), Shop Machinery Practice (35%) and Elements of Industrial Plant Machinery (35%). Mechanical Engineering is one of the programs with average number of examinees being administered by PRC. On the most recent ME exams conducted September 2017, 3,517 out of 5,098 passed while 31 out of 105 passed the CPM. Jay Nelson Talip Corbita from Xavier University ranked first in the ME exams garnering 92.20% rating followed by Von Eric Abag Damirez from University of Batangas having 90.15%. University of the Philippines - Diliman was the top performing school having 50 of its 52 examinees passed or 96.15% overall passing rate followed by Mindanao University of Science and Technology -CDO having 57 out of 60 examinees passed or 95.00%. During March 2017 ME board exams, 1,083 out of 1,904 passed the ME licensure examination while 19 out of 39 passed the CPM. Batangas State University - Alangilan Campus got the first spot in the top performing schools list having 100% overall passing rate or 66 out of 66 examinees passed. Brylle Pahimutang Gibuena from University of Cebu in Lapulapu & Mandaue ranked first in the exams having 88.10% rating followed by Niño Rey Jacoba Caraig from Polytechnic University of the Philippines - Maragondon garnering 87.80%. On September 2016 ME board exams, 3,110 out of 4,470 passed the Mechanical Engineer and 40 out of 68 passed the Certified Plant Mechanic licensure exams. University of the Philippines (UP)-Diliman was the top performing school having all of its 72 examinees passed. It was followed by Batangas State University (BSU) - Alangilan Campus having 95 out of 96 examinees passed or an equivalent 98.96% overall passing rate. Elso Umbao Elumbaring Jr. from Notre Dame University ranked first in the ME exams garnering 90.15% followed by Edcel Reblora Fortes from Sorsogon State College - Sorsogon having 89.40%. Meanwhile, here is the summary of results for Mechanical Engineering board exams in the last three (3) years. To receive up-to-date news about Mechanical Engineer board exam results for February 2018, we advise our visitors to bookmark this page, visit PRC official website or follow us at our social media pages via Facebook and Twitter. March 2018 ME and CPM board exam results are expected to be released very soon... Good luck everyone! Keep tuning in at this page to receive updates. Wala pa po bang update?